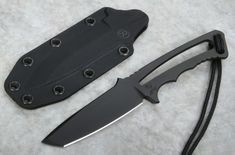 Chris Reeve's line of fixed blade knives is among the best on the market for any purpose. 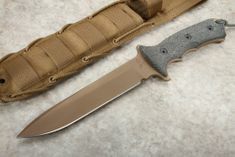 From military and combat to hunting and bushcraft, there's a fixed blade Chris Reeve knife for every need. Whether you are looking for a Nyala, Pacific or Professional Solider, you'll find it here. 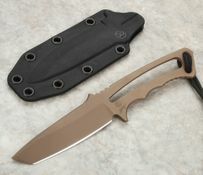 We also carry Chris Reeve Green Beret knives with partially serrated blades and much more. These high quality fixed blade knives all have one thing in common: they're made from the finest materials. Each is designed with style and functionality in mind, so no matter what look you prefer, these durable and reliable knives fit the bill. 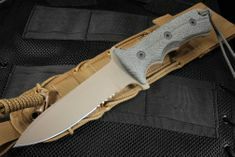 Chris Reeve's Green Beret provides superior performance in tactical fields, including military, combat, and survival functions. 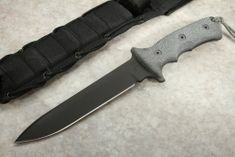 The Green Beret is built with either a 5.5- or 7-inch fixed blade of Crucible S35VN steel, boasting a 55-57 RC. 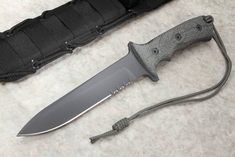 Featuring a handle made of durable, sandblasted black canvas Micarta, the Green Beret offers exceptional durability and shock absorption while maintaining a slim, rugged profile and unprecedented grip, even when wet. 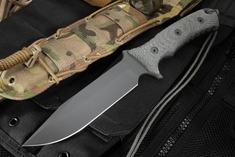 Weighing in at 11.8 ounces for the 5.5-inch blade or 12.8 ounces for the 7 inch blade, the Green Beret is perfect for carrying for military or survival uses. 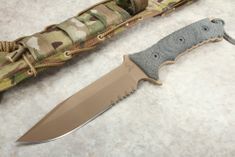 The Green Beret is available with a Black PVD or Flat Dark Earth PVD blade coating, with or without serrations. 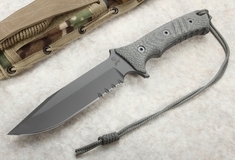 The Pacific is a fixed blade designed specifically for combat, military, and tactical duties. The name "Pacific" was chosen to honor the 1st Special Forces Group (Airborne), whose theater of operations consists of Asia and the Pacific. 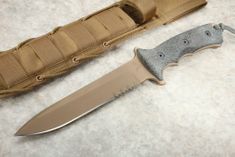 Built with a 6-inch clip point Crucible S35VN steel blade, and offered with or without a double row of serrations, the Pacific is designed to be as tough as the soldiers its name recognizes. 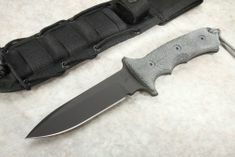 The durable, black canvas Micarta handle provides a superior grip, and the back of the handle is built with a glass breaker for use in emergencies. The Pacific is available with either a Black PVD or Flat Dark Earth PVD blade coating. 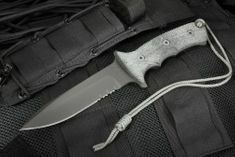 The modern version of a traditional skinning knife, Chris Reeve's Nyala provides exceptional capabilities in bushcraft and hunting. Nyala is a South African antelope found primarily in densely-forested areas. The 3.75-inch Crucible S35VN blade is available in two profiles, a standard utility drop point or Insingo, both boasting a 58-59 RC. 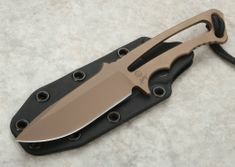 The Nyala offers superior performance in skinning, but will stand up to numerous bushcraft and survival applications. 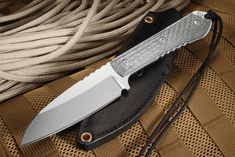 The Natural Canvas Micarta handle features linear and radial grooves to create a sturdy grip, even when wet, with more knife control added by serrations on the spine. 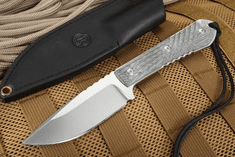 With a weight of 4.96 ounces, the Nyala is the perfect knife for carrying on hunting or outdoor expeditions. 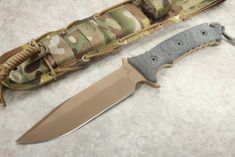 Built to honor Special Forces soldiers, Chris Reeve's Professional Soldier is a discreet, simple but elegant, frame style fixed blade. The Professional Soldier slips securely into a low-profile Kydex sheath, making it easily accessible whether it's in a pocket, around your neck, or attached to a MOLLE backpack or vest. 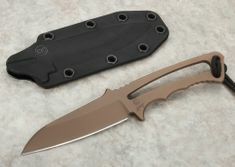 The 3.375-inch Crucible S35VN steel blade is available with either a Black PVD or Flat Dark Earth PVD blade coating, offering a 58-59 RC. Weighing in at just 3 ounces, the Professional Soldier provides durability and toughness packed into a lightweight design that is perfect for tactical, military, and combat uses.